Congratulations to Art Bowker for receiving the 2013 Sam Houston State University Award by the American Probation and Parole Association! 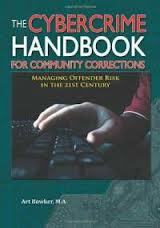 Art Bowker, author of The Cybercrime Handbook for Community Corrections: Managing Offender Risk in the 21st Century, was awarded the 2013 Sam Houston State University Award by the American Probation and Parole Association (APPA). The prestigious award is given to a practitioner who has an article published concerning probation, parole, or community corrections that provides new information and insight into the operations, effectiveness, or future of the community corrections profession. The APPA is an International organization composed of members from the United States, Canada, and other countries, actively involved with probation, parole, and community-based corrections, in both adult and juvenile sectors. For our podcast featuring Professor Bowker discussing his work and book, The Cybercrime Handbook for Community Corrections: Managing Offender Risk in the 21st Century, go here.